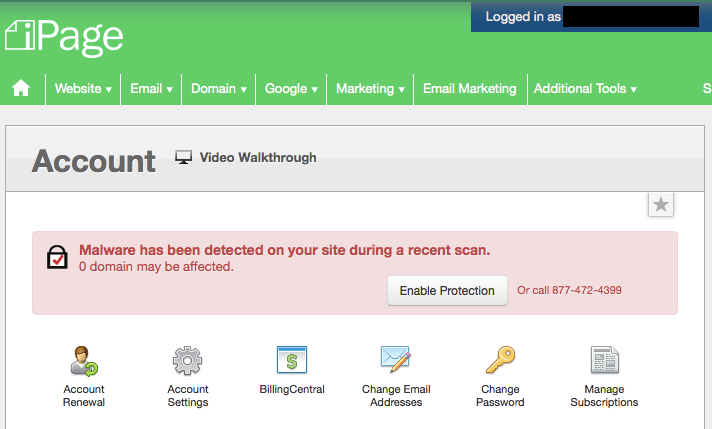 So there was malware detected on their site during a recent scan, but it impacted “0 domain”. Those seem like they are contradictory statements to us, but maybe something that doesn’t count as a domain was impacted? What we suggested to the website’s owner was to contact iPage for more evidence because that wasn’t enough based on that to give a second opinion as to the veracity of the claim, though it seemed unlikely considering the website was built with the Weebly website builder provide by iPage. We apologize for any inconvenience caused. I have performed a scan of your account and it is malware free. Right now there is no alert regarding infection is shown in the ControlPanel. If you receive an alert similar to this from iPage whether it actually lists a positive number of domains affected or not, our recommendation is to contact iPage for more information and then get a second opinion instead of signing up for a SiteLock service, which they are trying to sell you from that alert, right off the bat. Out of the blue comes this notice that I have to pay a “reduced special” of $100 a month to sitelock.